I didn't really pick up on the daisy trend that's been going round this year, I'm not sure why, but when WearAll.com got in touch to see if I'd like to try something from their plus size line. 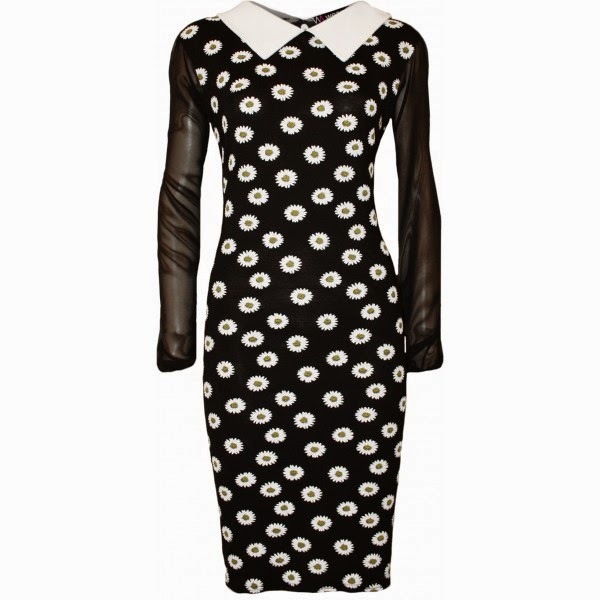 This daisy print dress caught my eye. Cute right? I'm new to Wear All, I hadn't heard of them before they contacted me. They have a fairly big selection of plus size pieces, all at low prices. There's a bit of everything in there, so it won't suit all tastes, but you might find some cute bits if you fancied a bit of a bargain splurge. I went for a really fun, early 90s kind of look with this one, adding a maxi jersey cardigan, chunky boots, and hat. And yes, I did dress like this the first time around. I'm wearing the 26/28 as I was advised to size up, but I think I would have been absolutely fine with the 22/24, it's a stretchy jersey, and I had loads of room in it. I love the collar detail and the daisy print is just perfect. I think in an ideal world i would have had a plain jersey sleeve or continued the print, that's just because I'm not a huge fan of chiffon, but I would probably always wear it with a cardigan or jacket anyway. For what it is, it's a fun, affordable piece that would perk up any wardrobe! I think this would also look great with leggings, pumps and a denim jacket, or try opaque tights and heels with an oversized clutch for an evening look! I love this dress on you and the daisy print is just so cute! You look amazing! The print is so cute and quirky and looks as though the dress is one of those versatile numbers that can take you from a conservative office to a wild night out with a change of heels and splash of lipstick! I ADORE you in this!! I agree, I didn't get into the daisy crazy, though I saw pieces I liked, just nothing that had wowed be as of yet. this dress takes the cake! I hadn't heard of wearall yet, so I went and perused the website, so many good items, I added them to my shopping bookmarks!